New Brakes signing Kurtis Revan. Leamington have boosted their options for the run-in with the signing of former King’s Lynn winger Kurtis Revan. Revan was released by the Linnets on Monday after Brakes put in a seven-day approach for the player having made 32 appearances and scored three times. A former Derby County scholar he moved to The Walks from Corby Town in August. “He’s versatile, quick and direct,” said Holleran of the 21-year-old who lives in Rugby. Meanwhile, Holleran believes his side have the experience to handle the pressure of the title race. Nineteen points from 21 have lifted Brakes four points clear of third and on to the heels of Southern Premier Division leaders Chippenham Town. And despite his side now looking the only serious challengers to the Bluebirds, Holleran said the high stakes will not affect his troops. “A lot have been through it before and a few lads have won titles,” said Holleran. “It’s human nature to look at the big picture but we’ve got to keep setting small targets and look after our own situation and we’ll get to where we need to be. “We’ve got to be as consistent and reliable as we can be, put in solid performances where we are disciplined and in control and handle the pressure well and we’ll go very close. “Chippenham have been fantastic. They’ve had a few poor results but they’ve not had a wobble. Eleven wins and a draw from their last 12 fixtures have lifted Chippenham to the summit. However, the last five victories have come by a single-goal margin and Holleran says he knows how draining Brakes’ relentless pursuit of them will be for manager Mark Collier having struggled to shake off Stourbridge during the 2012/13 title-winning campaign. “They’re grinding out results but I’ve been there, he’ll be going to bed having nightmares about us. And that’s what we’ve got to do, keep cranking up that pressure. “The four home games are going to be massive and we’ve got to keep picking up points away from home. “The margin has been cut but points on the board are important. “A few teams have to play each other and there will be some big games. Leamington play the first of their remaining home fixtures on Saturday when they entertain Dunstable, who come into the game on the back of a 2-0 win over Stratford on Tuesday night. 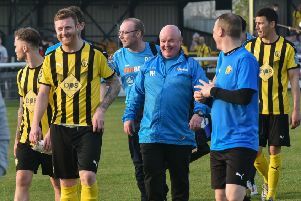 Brakes, in turn, were granted a free midweek and Holleran admitted it had come at the perfect time with five players on the treatment table on Tuesday, including Joe Magunda and Connor Gudger who are said to be “improving”.